March 16, 2013: Inbox.com Webmail 2013 Beta has just been released featuring a totally redesigned interface that enhances and improves the overall user experience. The new 2013 Beta version heralds the upcoming release of the service’s next major upgrade. A global overhaul of Inbox.com Webmail has been in the works for several months and incorporates improvements based on user feedback and technological improvements. The Inbox.com Webmail 2013 Beta version has been revamped to fully utilize the capabilities of the latest browsers and to rev up the entire email experience. This new and improved version of Inbox.com Webmail will replace the older version after extensive beta testing has been completed. 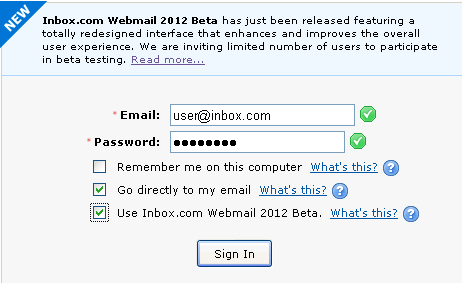 Inbox.com Webmail 2013 Beta can be accessed directly via the webmail login page by following the steps below. If you are signed in to Inbox.com Webmail, sign out by clicking on the Logout button located at the top right of your screen. Select the option “Use Inbox.com Webmail 2013 Beta” by checking the box and then click on the Sign In button. If you need to switch back to the old version, just log out, uncheck this box and then log back in. To log out from the new webmail, click on your email address at the top of the page and select Logout from the dropdown menu. Let us know what you think so that we can make Inbox.com Webmail an even better email service. We'd like to hear about your experience with the new service and how it compares to the previous version. Please send your feedback, comments and/or suggestions to beta@inbox.com.